"Maille" redirects here. For other uses, see Maille (disambiguation) and Chain mail (disambiguation). The earliest examples of surviving mail were found in the Carpathian Basin at a burial in Horný Jatov, Slovakia dated at 3rd century BC, and a in a chieftain's burial located in Ciumești, Romania. Its invention is commonly credited to the Celts, but there are examples of Etruscan pattern mail dating from at least the 4th century BCE. Mail may have been inspired by the much earlier scale armour. Mail spread to North Africa, West Africa, the Middle East, Central Asia, India, Tibet, South East Asia, and Japan. Herodotus wrote that the ancient Persians wore scale armour, but mail is also distinctly mentioned in the Avesta, the ancient holy scripture of the Persian religion of Zoroastrianism that was founded by the prophet Zoroaster in the 5th century BC. The origins of the word mail are not fully known. One theory is that it originally derives from the Latin word macula, meaning spot or opacity (as in macula of retina). Another theory relates the word to the old French maillier, meaning to hammer (related to the modern English word malleable). In modern French, maille refers to a loop or stitch. The Arabic words "burnus", برنوس, a burnoose; a hooded cloak, also a chasuble (worn by Coptic priests) and "barnaza", برنز, to bronze, suggest an Arabic influence for the Carolingian armour known as "byrnie" (see below). The first attestations of the word mail are in Old French and Anglo-Norman: maille, maile, or male or other variants, which became mailye, maille, maile, male, or meile in Middle English. 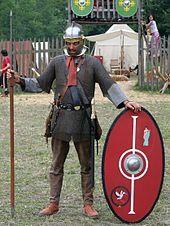 In the early medieval Europe "byrn(ie)" was the equivalent of a "coat of mail"
The modern usage of terms for mail armour is highly contested in popular and, to a lesser degree, academic culture. Medieval sources referred to armour of this type simply as mail; however, chain-mail has become a commonly used, if incorrect, neologism first attested in Sir Walter Scott's 1822 novel The Fortunes of Nigel. Since then the word mail has been commonly, if incorrectly, applied to other types of armour, such as in plate-mail (first attested in 1835). The more correct term is plate armour. Civilizations that used mail invented specific terms for each garment made from it. The standard terms for European mail armour derive from French: leggings are called chausses, a hood is a mail coif, and mittens, mitons. A mail collar hanging from a helmet is a camail or aventail. A shirt made from mail is a hauberk if knee-length and a haubergeon if mid-thigh length. A layer (or layers) of mail sandwiched between layers of fabric is called a jazerant. There is some dispute among historians as to what exactly constituted the Carolingian byrnie. Relying... only on artistic and some literary sources because of the lack of archaeological examples, some believe that it was a heavy leather jacket with metal scales sewn onto it. It was also quite long, reaching below the hips and covering most of the arms. Other historians claim instead that the Carolingian byrnie was nothing more than a coat of mail, but longer and perhaps heavier than traditional early medieval mail. Without more certain evidence, this dispute will continue. The use of mail as battlefield armour was common during the Iron Age and the Middle Ages, becoming less common over the course of the 16th and 17th centuries when plate armor and more advanced firearms were developed. It is believed that the Roman Republic first came into contact with mail fighting the Gauls in Cisalpine Gaul, now Northern Italy, but a different pattern of mail was already in use among the Etruscans. 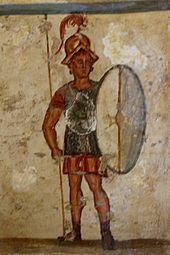 The Roman army adopted the technology for their troops in the form of the lorica hamata which was used as a primary form of armour through the Imperial period. 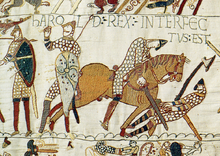 Panel from the Bayeux Tapestry showing Norman and Anglo-Saxon soldiers in mail armour. Note the scene of stripping a mail hauberk from the dead at the bottom. After the fall of the Western Empire, much of the infrastructure needed to create plate armour diminished. Eventually the word "mail" came to be synonymous with armour. It was typically an extremely prized commodity, as it was expensive and time-consuming to produce and could mean the difference between life and death in a battle. Mail from dead combatants was frequently looted and was used by the new owner or sold for a lucrative price. As time went on and infrastructure improved, it came to be used by more soldiers. Eventually with the rise of the lanced cavalry charge, impact warfare, and high-powered crossbows, mail came to be used as a secondary armour to plate for the mounted nobility. By the 14th century, plate armour was commonly used to supplement mail. Eventually mail was supplanted by plate for the most part, as it provided greater protection against windlass crossbows, bludgeoning weapons, and lance charges. However, mail was still widely used by many soldiers as well as brigandines and padded jacks. These three types of armour made up the bulk of the equipment used by soldiers, with mail being the most expensive. It was sometimes more expensive than plate armour. Mail typically persisted longer in less technologically advanced areas such as Eastern Europe but was in use everywhere into the 16th century. During the late 19th and early 20th century, mail was used as a material for bulletproof vests, most notably by the Wilkinson Sword Company. Results were unsatisfactory; Wilkinson mail worn by the Khedive of Egypt's regiment of "Iron Men" was manufactured from split rings which proved to be too brittle, and the rings would fragment when struck by bullets and aggravate the injury. The riveted mail armour worn by the opposing Sudanese Madhists did not have the same problem but also proved to be relatively useless against the firearms of British forces at the battle of Omdurman. During World War I, Wilkinson Sword transitioned from mail to a lamellar design which was the precursor to the flak jacket. From the Middle East, mail was quickly adopted in Central Asia by the Sogdians and by India in the South. Mail armour was introduced by the Turks in late 12th century and commonly used by Turk and the Mughal armies where it eventually became the armour of choice in India. Indian mail was constructed with alternating rows of solid links and round riveted links and it was often integrated with plate protection (mail and plate armour). Mail and plate armour was commonly used in India until the Battle of Plassey and the subsequent British conquest of the sub-continent. 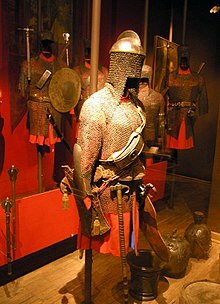 The Ottoman Empire used mail armour as well as mail and plate armour, and it was used in their armies until the 18th century by heavy cavalry and elite units such as the Janissaries. They spread its use into North Africa where it was adopted by Mamluk Egyptians and the Sudanese who produced it until the early 20th century. Ottoman mail was constructed with alternating rows of solid links and round riveted links. The Persians used mail armour as well as mail and plate armour. Persian mail and Ottoman mail were often quite similar in appearance. Mail was introduced to China when its allies in Central Asia paid tribute to the Tang Emperor in 718 by giving him a coat of "link armour" assumed to be mail. China first encountered the armour in 384 when its allies in the nation of Kuchi arrived wearing "armour similar to chains". Once in China, mail was imported but was not produced widely. Due to its flexibility, comfort, and rarity, it was typically the armour of high-ranking guards and those who could afford the exotic import (to show off their social status) rather than the armour of the rank and file, who used more common brigandine, scale, and lamellar types. However, it was one of the only military products that China imported from foreigners. Mail spread to Korea slightly later where it was imported as the armour of imperial guards and generals. In Japan mail is called kusari which means chain. When the word kusari is used in conjunction with an armoured item it usually means that mail makes up the majority of the armour composition. An example of this would be kusari gusoku which means chain armour. Kusari jackets, hoods, gloves, vests, shin, shoulder, thigh guards, and other armoured clothing were produced, even kusari tabi socks. Kusari was used in samurai armour at least from the time of the Mongol invasion (1270s) but particularly from the Nambokucho period (1336–1392). The Japanese used many different weave methods including a square 4-in-1 pattern (so gusari), a hexagonal 6-in-1 pattern (hana gusari) and a European 4-in-1 (nanban gusari). The rings of Japanese mail were much smaller than their European counterparts; they would be used in patches to link together plates and to drape over vulnerable areas such as the armpits. Riveted kusari was known and used in Japan. On page 58 of the book Japanese Arms & Armor: Introduction by H. Russell Robinson, there is a picture of Japanese riveted kusari, and this quote from the translated reference of Sakakibara Kozan's [ja] 1800 book, The Manufacture of Armour and Helmets in Sixteenth-Century Japan, shows that the Japanese not only knew of and used riveted kusari but that they manufactured it as well. Butted and or split (twisted) links made up the majority of kusari links used by the Japanese. Links were either butted together meaning that the ends touched each other and were not riveted, or the kusari was constructed with links where the wire was turned or twisted two or more times; these split links are similar to the modern split ring commonly used on keychains. The rings were lacquered black to prevent rusting, and were always stitched onto a backing of cloth or leather. The kusari was sometimes concealed entirely between layers of cloth. Ian Bottomley in his book Arms and Armor of the Samurai: The History of Weaponry in Ancient Japan shows a picture of a kusari armour and mentions kusari katabira (chain jackets) with detachable arms being worn by samurai police officials during the Edo period. The end of the samurai era in the 1860s, along with the 1876 ban on wearing swords in public, marked the end of any practical use for mail and other armour in Japan. Japan turned to a conscription army and uniforms replaced armour. Mail armour provided an effective defense against slashing blows by edged weapons and some forms of penetration by many thrusting and piercing weapons; in fact, a study conducted at the Royal Armouries at Leeds concluded that "it is almost impossible to penetrate using any conventional medieval weapon". Generally speaking, mail's resistance to weapons is determined by four factors: linkage type (riveted, butted, or welded), material used (iron versus bronze or steel), weave density (a tighter weave needs a thinner weapon to surpass), and ring thickness (generally ranging from 18 to 14 gauge (1.02–1.63 mm diameter) wire in most examples). Mail, if a warrior could afford it, provided a significant advantage when combined with competent fighting techniques. When the mail was not riveted, a thrust from most sharp weapons could penetrate it. However, when mail was riveted, only a strong well-placed thrust from certain spears, or thin or dedicated mail-piercing swords like the estoc could penetrate, and a pollaxe or halberd blow could break through the armour. Strong projectile weapons such as stronger self bows, recurve bows, and crossbows could also penetrate riveted mail. Some evidence indicates that during armoured combat, the intention was to actually get around the armour rather than through it—according to a study of skeletons found in Visby, Sweden, a majority of the skeletons showed wounds on less well protected legs. Although mail was a formidable protection, due to longswords getting more tapered as time progressed, mail worn under plate armor (and stand-alone mail as well) could be penetrated by the conventional weaponry of another knight. The flexibility of mail meant that a blow would often injure the wearer, potentially causing serious bruising or fractures, and it was a poor defence against head trauma. Mail-clad warriors typically wore separate rigid helms over their mail coifs for head protection. Likewise, blunt weapons such as maces and warhammers could harm the wearer by their impact without penetrating the armour; usually a soft armour, such as gambeson, was worn under the hauberk. Medieval surgeons were very well capable of setting and caring for bone fractures resulting from blunt weapons. With the poor understanding of hygiene, however, cuts that could get infected were much more of a problem. Thus mail armour proved to be sufficient protection in most situations. Several patterns of linking the rings together have been known since ancient times, with the most common being the 4-to-1 pattern (where each ring is linked with four others). In Europe, the 4-to-1 pattern was completely dominant. Mail was also common in East Asia, primarily Japan, with several more patterns being utilised and an entire nomenclature developing around them. Historically, in Europe, from the pre-Roman period on, the rings composing a piece of mail would be riveted closed to reduce the chance of the rings splitting open when subjected to a thrusting attack or a hit by an arrow. Up until the 14th century European mail was made of alternating rows of round riveted rings and solid rings. 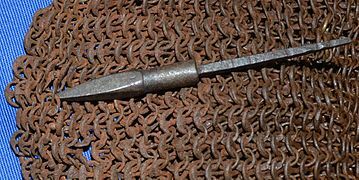 Sometime during the 14th century European mail makers started to transition from round rivets to wedge shaped rivets but continued using alternating rows of solid rings. Eventually European mail makers stopped using solid rings and almost all European mail was made from wedge riveted rings only with no solid rings. Both were commonly made of wrought iron, but some later pieces were made of heat-treated steel. Wire for the riveted rings was formed by either of two methods. One was to hammer out wrought iron into plates and cut or slit the plates. These thin pieces were then pulled through a draw plate repeatedly until the desired diameter was achieved. Waterwheel powered drawing mills are pictured in several period manuscripts. Another method was to simply forge down an iron billet into a rod and then proceed to draw it out into wire. The solid links would have been made by punching from a sheet. Guild marks were often stamped on the rings to show their origin and craftsmanship. 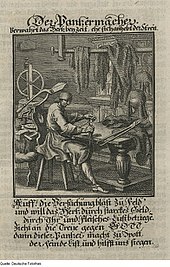 Forge welding was also used to create solid links, but there are few possible examples known; the only well documented example from Europe is that of the camail (mail neck-defence) of the 7th century Coppergate helmet. Outside of Europe this practice was more common such as "theta" links from India. Very few examples of historic butted mail have been found and it is generally accepted that butted mail was never in wide use historically except in Japan where mail (kusari) was commonly made from butted links. Butted link mail was also used by the Moros of the Philippines in their mail and plate armors. Mail is used as protective clothing for butchers against meat-packing equipment. Workers may wear up to 8 pounds (3.6 kg) of mail under their white coats. Butchers also commonly wear a single mail glove to protect themselves from self-inflicted injury while cutting meat. Woodcarvers sometimes use similar mail gloves to protect their hands from cuts and punctures. Scuba divers use mail to protect them from sharkbite, as do animal control officers for protection against the animals they handle. Shark expert and underwater filmmaker Valerie Taylor was among the first to develop and test shark suits in 1979 while diving with sharks. Mail is widely used in industrial settings as shrapnel guards and splash guards in metal working operations. Electrical applications for mail include RF leakage testing and being worn as a faraday cage suit by tesla coil enthusiasts and high voltage electrical workers. Conventional textile-based ballistic vests are designed to stop soft-nosed bullets but offer little defense from knife attacks. Knife-resistant armour are designed to defend against knife attacks; some of these use layers of metal plates, mail and metallic wires. Many historical reenactment groups, especially those whose focus is Antiquity or the Middle Ages, commonly use mail both as practical armour and for costuming. Mail is especially popular amongst those groups which use steel weapons. A modern hauberk made from 1.5 mm diameter wire with 10 mm inner diameter rings weighs roughly 10 kg (22 lb) and contains 15,000–45,000 rings. One of the drawbacks of mail is the uneven weight distribution; the stress falls mainly on shoulders. Weight can be better distributed by wearing a belt over the mail, which provides another point of support. Mail worn today for re-enactment and recreational use can be made in a variety of styles and materials. Most recreational mail today is made of butted links which are galvanized or stainless steel. This is historically inaccurate but is much less expensive to procure and especially to maintain than historically accurate reproductions. Mail can also be made of titanium, aluminium, bronze, or copper. Riveted mail offers significantly better protection ability as well as historical accuracy than mail constructed with butted links. Riveted mail can be more labour-intensive and expensive to manufacture. Japanese mail (kusari) is one of the few historically correct examples of mail being constructed with such butted links. Mail remained in use as a decorative and possibly high-status symbol with military overtones long after its practical usefulness had passed. It was frequently used for the epaulettes of military uniforms. It is still used in this form by the British Territorial Army. Mail has applications in sculpture and jewellery, especially when made out of precious metals or colourful anodized metals. Mail artwork includes headdresses, decorative wall hangings, ornaments, chess sets, macramé, and jewelry. For these non-traditional applications, hundreds of patterns (commonly referred to as "weaves") have been invented. Large-linked mail is occasionally used as a fetish clothing material, with the large links intended to reveal – in part – the body beneath them. In some films, knitted string spray-painted with a metallic paint is used instead of actual mail in order to cut down on cost (an example being Monty Python and the Holy Grail, which was filmed on a very small budget). Films more dedicated to costume accuracy often use ABS plastic rings, for the lower cost and weight. Such ABS mail coats were made for The Lord of the Rings film trilogy, in addition to many metal coats. The metal coats are used rarely because of their weight, except in close-up filming where the appearance of ABS rings is distinguishable. A large scale example of the ABS mail used in the Lord of the Rings can be seen in the entrance to the Royal Armouries museum in Leeds in the form of a large curtain bearing the logo of the museum. It was acquired from the makers of the film's armour, Weta Workshop, when the museum hosted an exhibition of WETA armour from their films. For the film Mad Max Beyond Thunderdome, Tina Turner is said to have worn actual mail and she complained how heavy this was. Game of Thrones makes use of mail, notably during the "Red Wedding" scene. ^ Ashton, Kasey. "The Celts Themselves." University of North Carolina. Accessed 4 November 2018. ^ "Celtic Chainmail | Brendan Mac Gonagle - Academia.edu". ^ "Celtic chainmail – Balkan Celts". ^ Laufer, Berthold (1914-01-01). Notes on Turquois in the East. Archived from the original on 2017-12-23. ^ Bennet, M., Bradbury, J., DeVries, K., Dickie, I., & Jestice, P. Fighting Techniques of the Medieval World. Thomas Dunne Books, 2005, p. 82. ^ "Men Who Wear Armour". The Daily Mail. 1886. ^ Randolph, T.H. (1892). The Wilkinson Sword Catalog. The Wilkinson Sword Co. Ltd. p. 41. ^ Robinson, H. Russel (2002). Oriental Armour. Courier Dover Publications. p. 85. ^ Stone, George Cameron (1999). A Glossary of the Construction, Decoration and Use of Arms and Armor: In All Countries and in All Times. Courier Dover Publications. p. 69. ^ Japanese Arms & Armor: Introduction by H. Russell Robinson, London, Arms & Armour P., p. 58, ISBN 9780853680192. ^ a b c George Cameron Stone (2 July 1999). A Glossary of the Construction, Decoration, and Use of Arms and Armor: In All Countries and in All Times. Courier Dover Publications. p. 424. ISBN 978-0-486-40726-5. Archived from the original on 3 June 2016. Retrieved 18 February 2011. ^ George Cameron Stone (2 July 1999). A Glossary of the Construction, Decoration and Use of Arms and Armor: In All Countries and in All Times. Courier Dover Publications. p. 61. ISBN 978-0-486-40726-5. Archived from the original on 1 May 2016. Retrieved 18 February 2011. ^ "Arms & Armor 12th Century Spear VS. Riveted Mail and Ballistic Gel". Archived from the original on 2017-12-23. ^ Thordeman, Bengt (1940). Armour from the Battle of Wisby 1361. Stockholm, Sweden: Kungl. Vitterhets Historie och Antikvitets Akademien. p. 160. ^ a b Mitchell, Piers D. Medicine in the Crusades: Warfare, Wounds and the Medieval Surgeon. Cambridge University Press, 2007. ^ Horsfall, I. et al., "An Assessment of Human Performance in Stabbing", Forensic Science International, 102 (1999). pp. 79–89. ^ Richardson, T. (2011). "Armour in England, 1325–99". Journal of Medieval History. 37 (3): 304–320. doi:10.1016/j.jmedhist.2011.06.001. ^ Schlosser, Eric (September 3, 1998). "Fast-Food Nation: Meat and Potatoes". Rolling Stone magazine (USA), Issue 794. Archived from the original on January 13, 2013. Retrieved 2007-12-05. ^ Blake, Terry. "Dr Zeus - Testing of HV Suit w Twin Musical Tesla Coils". Daily Planet Segment 2008. Discovery Channel. Archived from the original on 2011-08-29. ^ Cameron, Christian (2013-08-01). The Ill-Made Knight. Orion Publishing Group. ISBN 9781409142430. Wikimedia Commons has media related to Mail (armour). Wikimedia Commons has media related to Kusari (Japanese mail armour).